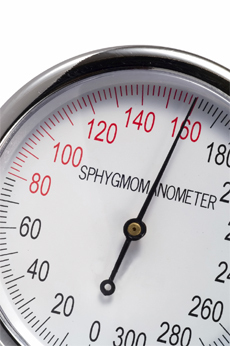 High blood pressure is one of the commonest conditions that affects divers throughout the world, but this is no great surprise really as it's one of the commoner conditions amongst the general population as well. As a diving doctor I see the issues surrounding high blood pressure (hypertension) causing a lot of confusion amongst non-medically trained divers. Why can't I dive doc? How high can it be before I can't dive? Can I dive now I'm on tablets for it? These are just a few of the daily questions I get sent throughout the year. Well let's go for a stroll through the maze that is high blood pressure and diving. Blood pressure is always quoted as two numbers and as a rough guide it is age +100 as the first number over anything from 60 to 100. An average BP for a 40 year old would be 140/80. Now the first number is called the Systolic figure and represents how much work the heart has to do to push the blood around the body. The harder it has to work the higher the figure. What makes it have to work harder is often the state of the arteries through which the blood is flowing. If they are thickened and inelastic due to age or fatty deposits the heart has to push harder and the systolic figure rises. The second figure is the Diastolic blood pressure. This is the blood pressure between beats and seen as a more accurate resting blood pressure. Again a high number here indicates poor health and a bad arterial and venous system. Now the current guidelines say that any new diver with a BP above 150/90 shouldn't be allowed to dive, and any existing diver with a BP over 160/100 should quit diving until it's sorted out. Why? Well, it's not because of the BP itself as it's simply a number, but what the consequences of a high BP are. In the short term uncontrolled hypertension can increase your chances of having a stroke as the raised systolic pressure means the poor old heart is really pushing hard and so the fragile arteries in the brain are at risk of bursting. This, if it were to happen underwater, would not only lead to a quick demise for the diver but also endanger their buddy too. The long term dangers are more related to a persistently raised diastolic pressure. Disease of the kidneys and the blood vessels that supply the heart are a factor here, and this would cause problems to a diver as the risk of heart attack and heart failure are very much increased. Once again leading to potentially fatal consequences underwater. So you can see why the two don't really mix well. But one of the issues here is how can you tell who really has high blood pressure? Blood pressure varies throughout the day increasing when you are active and lowering gently at night time when you sleep. So if you are 30 minutes late to see the doc, rush up three flights of stairs and straight onto the couch and have the cuff put on your arm. "Mmmm" he will say, "180/120, sorry you can't dive!" Would this be fair? Of course not. Blood pressure should never be assumed after one solitary reading if it is high. A lifetime's medication and being told never to dive should be a consequence of a whole series of readings and that is why I always insist on a test called "24 hour BP monitoring". This is a small cuff attatched to your upper arm at one end and a computer gizmo at the other. It gives a BP reading every 5 to 10 minutes. At the end of the 24hour period an average is worked out and a far better picture of whether you are truly hypertensive or not can be obtained. Quite often a person with an isolated high reading at their doctors is found to be normal by this method, so avoiding all those tablets, and allowing you to dive straight away. So if you have only a slightly raised BP ie anything below 190/110 then always insist on a 24hr monitor. Above this figure then you should go straight onto medication as your risk of a stroke is quite high. But what if the 24hr reading is still too high? Well then it's medication time for you and this is where it gets very interesting with diving. This is because there are about six groups of different compounds that can be used to treat hypertension. Some are fine to dive on, but others aren't. The most commonly prescribed are beta blockers such as atenolol or propranolol. They work well in reducing blood pressure, but the problem with diving is that they can cause constriction of the airways and also reduce the response of the heart to exercise. This can cause a back log of blood to the heart which collects in the lungs. Bad news if you are swimming against a really hard current towing a sick buddy. So stay off these if you want to dive safely. Another commonly used medication is called a diuretic and basically makes you pee more often. This reduces your circulating blood volume so making it easier for your heart to function. But above water a few extra trips to the toilet may be OK but underwater it can reduce your ability to off gas your nitrogen. End result, a bend. I don't recommend these tablets either to divers. What I do think are one of the better ones are the ACE inhibitors. They've been around for a long time now, and are derived from a protein found in snake venom. They have few side effects relevant to diving except a dry cough. If this happens there is a theoretical risk of coughing out your regulator so the next step is to try the ACE inhibitors brand new cousin, the A2RI. Better known as losartan I think this is the perfect blood pressure tablet for a diver with hypertension. But like all good things in life there is a catch. It's the most expensive of them all, but for most divers happy to spend their hard earned dollar on dive gear it won't break the bank. It is a well known fact that people will only remember six things from a lecture, a TV programme or a written article. But I'll make it easy with three this time. Don't dive with untreated hypertension, the deep is the last place you want a stroke or heart attack. Make sure the doc is right with the diagnosis. Take only ACE inhibitors or A2RI's for it. There is a fourth, try losing some weight as this means you won't need the tablets at all. Simple really!